This article originally appeared on transforming-science.com. Natalia Surzenko, Ph.D., is part of a team of researchers at the UNC-Chapel Hill Nutrition Research Institute (NRI) located on the North Carolina Research Campus (NCRC) in Kannapolis focusing their efforts on brain development. 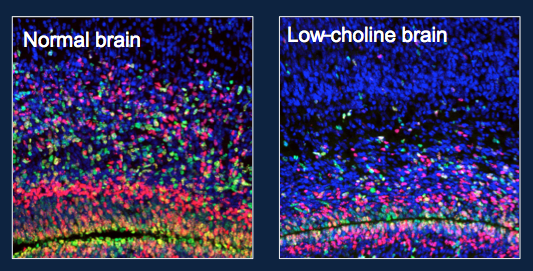 Her current goal is to determine the role of choline as an essential nutrient for development of the cerebral cortex. The NRI’s director, Steven Zeisel, M.D., Ph.D., was among the first scientists to discover that choline is an essential nutrient that is especially needed by pregnant women to ensure proper fetal development. Surzenko is building on his legacy by looking for specific structural changes in the brain caused by a low-choline diet. In a recent study published in the FASEB Journal, Surzenko and her colleagues observed and measured in a mouse model the impact of a low-choline diet on neural progenitor cells through stimulation of a protein called epidermal growth factor receptor (EGFR). Surzenko was able to study the expression of EGFR protein thanks to confocal microscopy available just across the street from the NRI at the David H. Murdock Research Institute (DHMRI). The use of DHMRI’s confocal microscopy helped Surzenko determine that a low-choline diet reduced EGFR receptor expression in neural progenitor cells both in whole brain samples and isolated neural progenitor cell samples.